Singer-songwriter Guy Smith releases his third full-length album of original songs titled ‘River of Song,’ recorded and produced in Sault Ste. Marie. Smith’s catchy folk melodies share experiences of life, love, travels, and interesting people. “People tell me that my songs tell stories, and take them on trips around the world,” said Smith. Base tracks for the 12 songs were recorded ‘live of the floor’ in producer Rusty McCarthy’s garage studio with an ensemble of Smith (lead vocals and guitar), McCarthy (lead guitar), Martin Virta (stand-up bass), and Marc Dubreuil (drums and percussion). 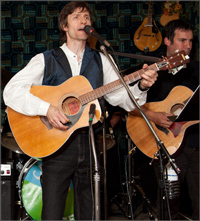 Subsequent musical textures were added by McCarthy (on a variety of stringed instruments), Sheldon Jääskäläinen (violin), Val Powley (backing vocals), and Clay Busch (percussion). “River of Song” is Smith’s third project of original work, following “Stumbled Onto You” (2011, also produced by McCarthy), and the self-produced “Flashes Struck from Midnights” (2010). Guy Smith wants the community to benefit from the release of his second full-length CD, ‘Stumbled Onto You,” to be launched November 12. So he’s donating half the proceeds from the event to ARCH – the Algoma Residential Community Hospice. “The hospice means much to me and my family, and has touched the lives of many in the community,” says Guy. ARCH provides a serene and comfortable place to spend the final days of life. The facility depends on donations to help meet operating costs. The new album offers 14 original songs, and is backed by a cast of musicians assembled by producer Rusty McCarthy. It is Guy’s second release of original work, following ‘Flashes Struck from Midnights” released in 2010. The songs span a range of styles: folk, latin, rock ‘n roll, even Caribbean. A poet and lyricist first, Guy’s songs are thoughtful reflections on life. “I have one song called ‘Melomel’ about my Father-in-Law, and how he lived his life giving to others. He spent the last five weeks of his life at ARCH,” reflects Guy. The CD Release Event takes place November 12 at The Water Tower Pub, Algoma’s Water Tower Inn, starting at 8 pm. A number of musicians will share the evening with Guy. Tickets are $10 in advance or at the door. Community partners include ARCH, Arts Council of Sault Ste. Marie and District, Stone’s Office Supply, Thomas Walls School of Music, The Rad Zone, Circle of Creative Arts, and Pilates for Me. These organizations have a supply of tickets for sale. The album culminates eight months in the studio with recording engineer Rusty McCarthy, who produced the album. “His talent and that of the other musicians on the project helped me climb new scales musically,” said Smith, of the recording experience. The tracks span a range of musical styles: folk, latin, rock ‘n roll, even Caribbean. With plenty of material to share, Smith is gradually taking to the performing stage. “There’s been some big steps to take from songwriting to studio work to performing. Each step has been full of challenge and awakening,” said Smith, reflecting on the past year. Along the way he’s met a number of songwriters and other artists who have taken interest in his material and even provided helping hands with musical accompaniment. “I’ve never thought of myself as an artist. But staff at the Arts Council of Sault Ste. Marie and District said, ‘yes you are,’ and then offered some practical suggestions. Likewise, staff at Music and Film in Motion have helped me learn how to gain exposure,” said Smith. Al’s Corner Pub was alive with songs, poetry, and laughter Friday night at Guy Smith’s CD release party. “The place was really hopping. I loved it when folks took to the dance floor for ‘Nineteen Years’ and the ‘Beanmaker’ said Guy, enthused by the show of support for his first recording effort. The night featured two solo sets with a sampling of songs from the CD, Flashes Struck From Midnights, and other crowd favourites from Guy’s repertoire of original work, including “Stumbled onto You, and “Adriano Avelino. “I was a bit nervous at first, but told myself to relax and have fun and that’s what I did. Don’t take yourself too seriously and let folks be free to have a great time together – that’s exactly what happened Friday night, said Guy. Following a rousing interactive version of “Session Band, the Vagabonds took to the stage for the first set of tracks from the CD including, "October Sky; "Surrender; "Let it Go; and "Thanksgiving Day. "The band took Guy’s songs to a new level, and gave them big, full sound that really filled the place, said one of his fans, Cheryl Widdifield. The Vagabonds include Marty Siltanen on bass, John Pedlar playing lead, and Rob Chiarello on drums. Jamie Smith, rhythm guitarist, was sound man for the night and doubled as the emcee. "Guy loves his audience and wants to know every fan and musician personally. Lyrically he's prolific. Don’t tell him anything you don’t want to end up in a song! remarked Jamie. "Al’s Song was another crowd pleaser, a sing-a-long that captures the spirit of Al’s Corner Pub, where folks “tap their feet on the floor, leave their worries at the door; everyone has a song to sing at Al’s. The second set wrapped up with “Joy Man, a calypso-influenced dancing song that kept folks on the dance floor. Guy thanks all who joined him Friday and the businesses that supported the night with door prizes: Mathewson OfficePro; Spadoni’s Furniture and Appliances; Thomas Walls Music; The Rad Zone; and Fresco European Grill. Guy’s CD Release Party will be October 15 from 8 to 10 pm at Al’s Corner Pub (located at Cathcart and James Streets, across from the James Street Furniture building) - Show in Google Maps . Come and meet Guy and enjoy live performances solo and with backup band “The Vagabonds. Guy Smith loves writing lyrics and poetry. For years he has been quietly filling up a basket of songs. Now it’s time to bring it up from the cellar, put it on the table and offer a sample of what he’s been making. Flashes Struck From Midnights is Guy’s first release of 14 original songs. "It’s simple music. And what I’m ready to share after spending some time in this world with a pencil and paper and my guitar. He got the title from the Robert Browning Poem Cristina. Now 46 and living in Sault Ste. Marie, Ontario Canada, Guy notes that some of the tracks originated from boyhood. "Getting along in life can mean discovering the wonders of youth over and over. That’s what song writing does for me. The CD is available on-line through or at the Rad Zone in Sault Ste. Marie, which supports the work of local artists.